During the period 1992-93, on instructions by the Kiro Gligorov's government, new state school textbooks of History and Geography were introduced in the secondary level education of the Former Yugoslav Republic of Macedonia. These books are still in use. After an examination of 12 such textbooks it has become apparent that the new leadership in Skopje is perpetuating in its educational system certain negative features associated with the former Communist regime. This is the reason why it is important, at this juncture, to study carefully the contents of these books. They may give us a better insight to the politics pursued by FYROM. But they may also generate interest in finding ways to overcome the repetition of past mistakes which have kept the Balkan peoples apart. Such an approach is not a new one. Stamped with the bloodshed of two world wars, the role of school textbooks was finally understood by those sempiternal enemies, France and Germany. In the 1950's the leaders of the two countries courageously decided to cleanse the festering abscess of hatred. They gathered their historians and the school textbook writers around a conference table for the purpose of finding a way to clear the atmosphere of the weight which generation after gereration had created by reproducing the same antagonistic stereotypes. The task was far from easy, but the positive results are evident to the naked eye in the attitudes of today's French and German youth. The initiative of those traditional enemies has been imitated throughout Western Europe. Particularly active in this field today are the Council of Europe. UNESCO and the Georg Eckert Institute in Germany. Beginning of lecture given at the Thessaloniki Chamber of Commerce and Industry Hall (March 23, 1994), under the auspices of the Museum of the Macedonian Struggle and the Institute for Balkan Studies. 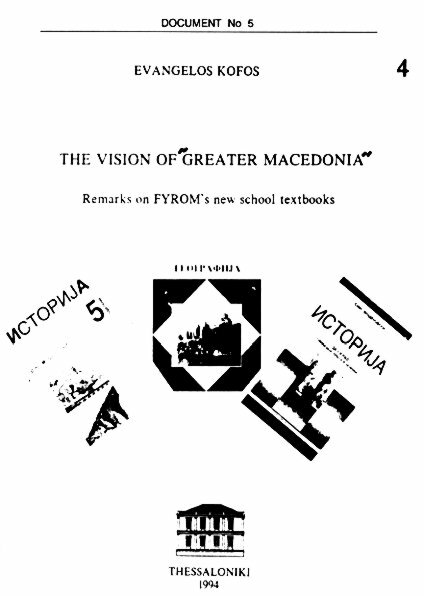 The presentation of the history of Ancient Macedonia in the Classical and Roman periods is treated at considerable length in FYROM's school textbooks. Appropriate texts, maps and illustrations are chosen to support an indirect linking of today's "Macedonians" with the history and the culture of the Greek Macedonians of the ancient world. 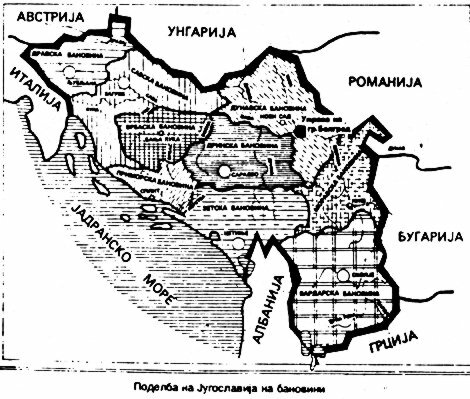 The familiar "map-model" of a "united" Macedonia. The explanatory note defines in broken line the state boundaries, while the solid line indicates the geographical ethnic boundaries. Although actual national borders are indicated, Greece and Bulgaria are depicted as contiguous to Macedonia. (Grade 8 History for the natural sciences and mathematics stream. Skopje 1992, page 162). "The evolution of the Greek tribes" (Ionians, Dorians and Aiolians). The absence of any Greek tribe in ancient Macedonia is striking. 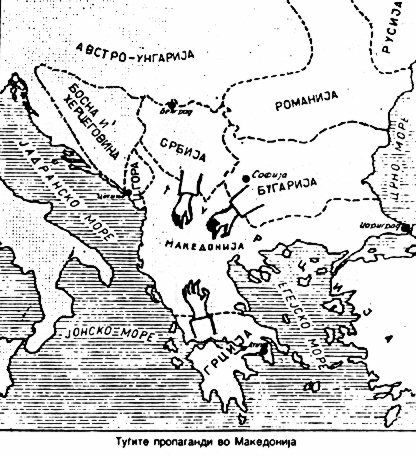 The editors' attempts to present Macedonia (and Thrace and Epirus as well) as unsmirched by any contact with Greece is blatant. (History V, Skopje 1992, page 74). Showing ancient Greece in three sections: the Peloponnese, Central Greece and Northern Greece. 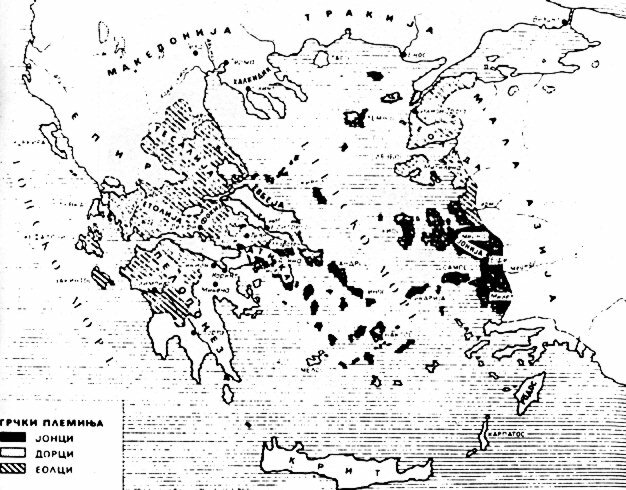 Northern Greece is depicted as including only Thessaly and Epirus. Two separate countries - "foreign" (?) to Greece - are indicated as lying to the north of Mt. Olympus and the Aliakmon River: Macedonia and Thrace. (Grade 7 History for the general stream. 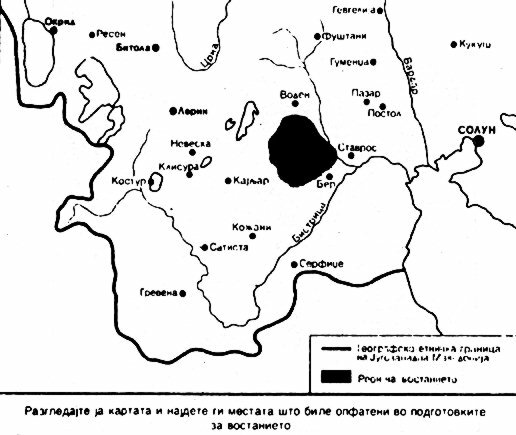 Skopje 1992, page 87). 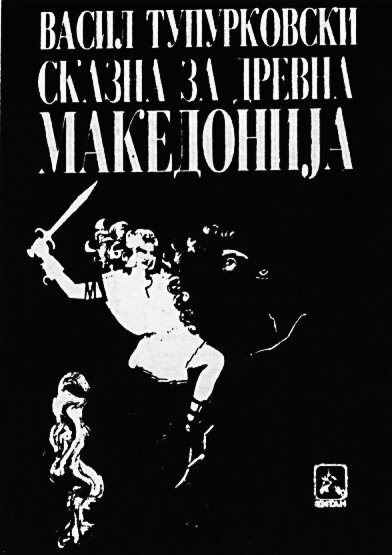 A new (1994) illustrated children's edition, about the feats of the Ancient Macedonians, portraying Alexander the Great and Bucephalos in a romantic light. Written by Vasil Tupurkovski, a leading political personality in Skopje, this is a clever popular version of history, which reveals the lengths to which the "Macedonian" national ideology will go even in the field of Ancient Macedonia. 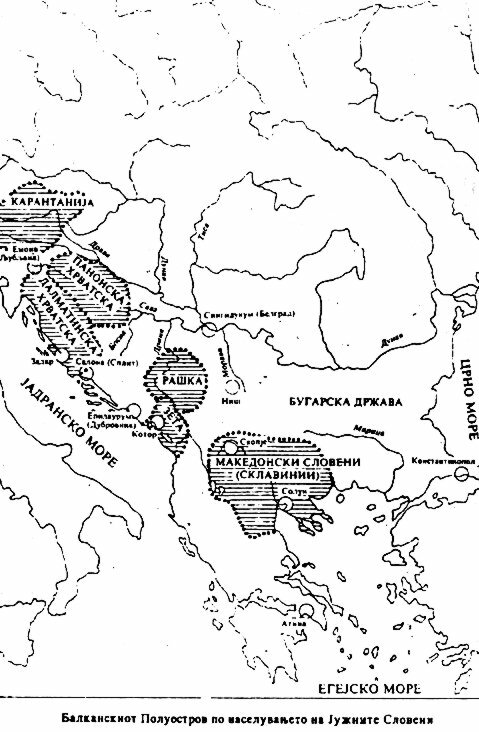 The entire area known today as Macedonia, including Mt. Olympus, Chalkidiki, and Mt. 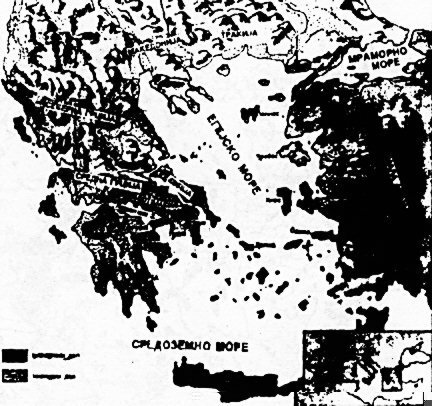 Athos but excepting Thessaloniki, is presented as inhabited by "Slav Macedonians". Both the boundaries and the national terminology used were completely unknown at that time. (Grade 7 History, natural sciences and mathematics stream. Skopje 1992, page 155). "Thessaloniki brothers Cyril and Methodius"
The text accompanying the picture of the two missionaries creates the impression that the apostles themselves, by ancestry, as well as their mission, belonged to the Slavs, who temporarily settled in the Thessaloniki region. (Grade 7 History, natural sciences and mathematics stream. Skopje 1992, page 164). The 1822 insurrection in Naousa is presented as one of the first risings of the "Macedonians" in the context of the national liberation movements of the Slavs for Macedonia. This is a clumsy attempt to appropriate both the Greek insurrectionists as individuals as well as their insurrection, which aimed at the liberation and unification of Macedonia in a hellenic state. (Grade 9 History, general stream. Skopje 1992, page 88 and History VII, 2nd edition, Skopje 1993, page 76). The picture speaks for itself. The students of this class are taught that Greece, Bulgaria and Serbia had predatory intentions towards Macedonia. It is nowhere mentioned that these states were struggling to free their subjugated brothers in Macedonia and the other Christian provinces of the Ottoman Empire. (Grade 9 History, general stream. Skopje 1992, page 109). 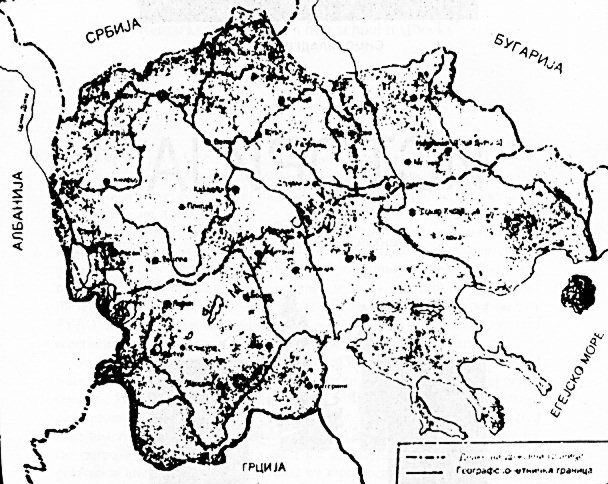 "Division of Yugoslavia into Banovinas"
As it appears from the map, the name "Vardarska Banovina" was the administrative denomination of today's FYROM during the inter-war period. (Grade 8 History, general stream. Skopje 1992, page 99).